The U.S. Army had more doctors than it needed prior to the Civil War. Surgeons and their assistants found themselves working in remote outposts, spread throughout the country and on the Western Frontier. Their patients were a small numbers of soldiers who saw little conflict. Only diseases such as malaria and yellow fever were troublesome. Surgeons were rarely involved with such diseases however. 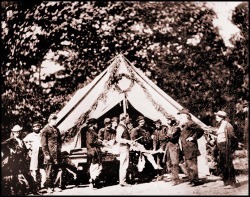 As the Civil War approached the quality of medical training had decreased tremendously. These inexperienced, unknowledgeable surgeons and doctors soon found hundreds of injured and dying men dependent on them. The Union and Confederate armies shared similar medical practices. Each regiment had one surgeon, and one assistant surgeon. Their duties included daily examinations of soldiers’ ailments, and dealing with battlefield injuries. The instruments and medications used for surgery were often the personal property of the particular surgeon. Anaesthesia had not become familiarized on the battle field and opium was the primary drug used by patients to cope with severe pain. 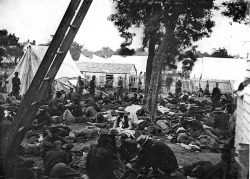 Surgery in Civil War field stations and hospitals was quick and barbaric. Oftentimes lines of soldiers would have to wait and endure the sight of their fellow soldiers being hacked, while they waited their turn. As the war progressed anaesthesia was used on surgeries in medical hospitals. Chloroform and ether were utilized in preparation to remove bullets or amputations. This was done as quickly as possible, both because of the surgeon’s need to see other patients, and the continuation of the tradition of speedy surgery from the time before anesthetics. Gangrene and maggots were common sights in Civil War hospitals as infection would overtake peoples’ wounds and as bodies would rot, quickly decomposing after death. Needless to say, the survival rate of Civil War surgeries was not very high. Many patients died from poor care or major infection. Surgeons aboard naval vessels during the Civil War were presented with unique circumstances and problems that their land based counterparts did not have to deal with. The difficulty of performing surgery or any other medical task could be greatly amplified by the movements of the ship. Additionally, army surgeons could usually find areas behind the front lines to stage their treatment areas, whereas navy surgeons had to perform their craft amidst the battle of the ship. Navy surgeons working during a battle were in constant and immediate danger. The creation of Union Hospital Ships allowed patients to be cared for on route to mainland hospitals. Long rows of beds with surgical equipment were contained within the hull of the ship. Nurses and surgeons would conduct necessary surgeries to save the patient or to stabilize them until they could reach a land hospital weeks later. Women played a much greater part in medicine during the Civil War than previously due to the vastly increased demands of the armies for medical care. 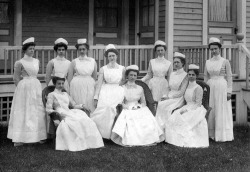 Working almost always in military hospitals, as opposed to the battlefield, women volunteered as nurses for both the North and South. Their duties included cleaning the wards and patients, caring for the patients’ food and general comfort, and assisting the doctors with any other duties.